The high-relief version of the $20 Saint-Gaudens Double Eagle was first minted in 1907, 12,367 of these coins were struck. However, the US mint insisted on a low-relief version, as the high-relief coin took up to eleven strikes to bring up the details and didn’t stack correctly for banking purposes. 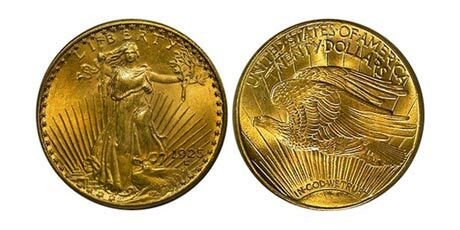 Considered by many collectors to be the most beautiful gold coin ever struck, and certainly the most popular of all U.S. coin designs, $20 Saint-Gaudens double-eagles are always in extremely high demand by collectors and investors alike. On the obverse of the coin, Liberty is portrayed striding toward the viewer into the dawn of a new day. In her right hand is a torch held aloft, and in her left hand is an olive branch. The Capitol building can be seen in the background to the lower left. At the top is the word LIBERTY and around the border are 46 stars representing the states of the Union in 1907. The setting for the obverse was taken from Saint-Gaudens’ much acclaimed Victory, a sculpture that is part of the Sherman Monument in New York City’s Central Park. The reverse of the coin depicts an American eagle in flight above the sun’s rays, with the inscription UNITED STATES OF AMERICA TWENTY DOLLARS arching across the top. As the last gold piece struck by the U.S. government for regular issue, the $20 Saint-Gaudens will forever remain a symbol of the emerging greatness of the United States in the 20th Century, and deserves a prominent place in every coin collection.